I admit I’m a theater addict. Long before I became a theater critic, I saw a lot of theater–50 or 60 plays a year. That total often included a trip to a theater festival, where we would see six or seven plays in a weekend. So being able to see and write about two or three plays or more a week is a glorious way to focus my writing. Having said that (and I intend to write more on that in the future), these are some plays I’ve seen recently and found insightful and inspiring. This is great Chicago theater by great playwrights. Well, most of them anyway. My reviews are all on Third Coast Review, our seven-week old website. Check it out, please, and sign up in the left-hand column to get our weekly newsletter, which summarizes the best of the 3CR week. 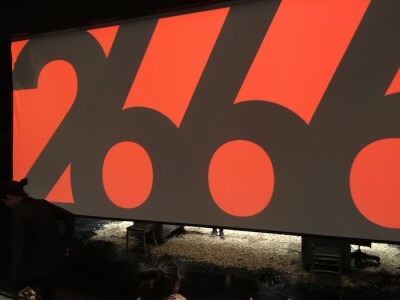 Intermission at 2666. Photo by Nancy Bishop. This marathon theater piece runs five-and-a-half hours because it is an adaptation of the massive novel by the late Chilean writer Roberto Bolaño. Robert Falls and Seth Bockley have done a masterful job of adapting and directing this production, although my review is not wholly complimentary. Among other things, I called it “a beautiful mess.” I do recommend it for committed theatergoers–because who else would sit through that much theater? Four acts and three intermissions. Thru March 20. Annie Baker won a Pulitzer Prize for her script for The Flick and her dialogue is sharp and her characters are realistic. This is a play about three low-wage workers in an old movie house. Over the course of three hours plus, we gradually get to know them and their relationships. There’s also a lot of film talk, including the digital vs. film debate. I gave this one four stars and I strongly recommend it. Thru May 8. Pop Waits. Photo by Joe Mazza/Brave Lux. 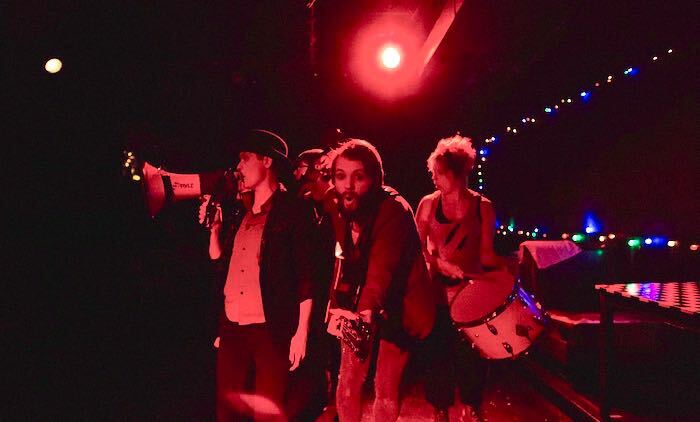 Homage to Iggy Pop and Tom Waits by two talented clown/actors/singers. Malic White and Molly Brennan make this one very fun and a little sad as they add their own stories to the music. Mostly original music by three fine musicians. Thru March 12 at the Neo-Futurarium. My review. The Tennessee Williams classic gets a thoughtful production by the Hypocrites. Director/actor Hans Fleischmann has basically remounted the production that originated at Mary-Arrchie and then moved to Theater Wit in 2013. My review noted that “Fleischmann as the narrator and poet Tom wanders in and out of time, in his homeless-man persona, as future Tom and past Tom. He’s the son of the Southern belle mother, Amanda (Kate Buddeke), and brother of fragile Laura (Joanne Dubach).” Superb acting in this memory play, which premiered in Chicago in 1944 and was instrumental in jumpstarting Williams’ career. Thru March 6. American Buffalo. Photo by Michael Brosilow. 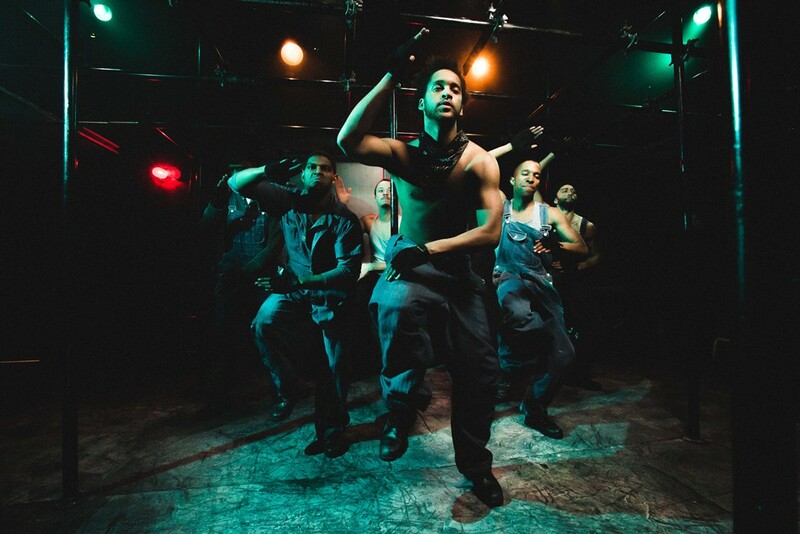 This is classic Chicago theater by a 30-year-old theater company that is about to fold. This is the final production for Mary-Arrchie Theatre, as I explain in my review. And it’s a grand way to go out with this superb production of one of David Mamet’s early plays. 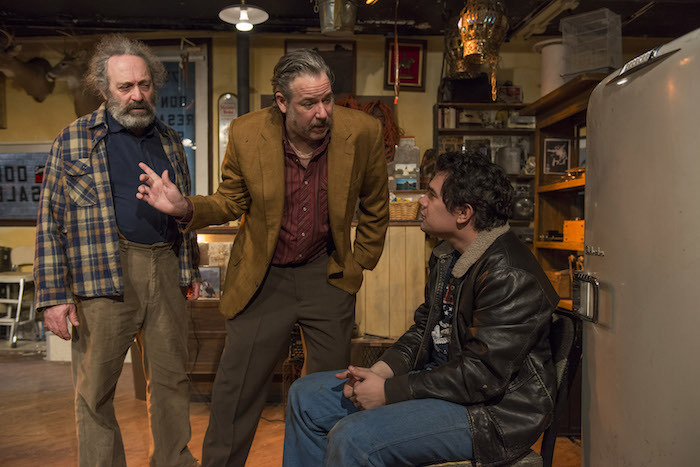 American Buffalo is “set in a junk shop on the north side of Chicago. You can see it the way a storefront production should be seen: sitting five feet from the stage, possibly endangered by flying spittle or stray props.” It’s hilarious, snarling Mamet and it runs thru March 20. And that’s it. Profiles is staging 11 short plays by Neil LaBute at their space on North Broadway in Buena Park. You can see them in two parts–five plays in Vices and six in Virtues–on one day or on separate days. The writing is outstanding. LaBute’s dialogue is a bit Mametesque and his characters and plots are outrageous and inventive. Each of the 11 plays is each very different from the others and why one set is named Vices and the other Virtues is not clear to me. None of them is very virtuous. Thru March 6. The Hairy Ape. Photo by Joe Mazza/Brave Lux. Oracle, which calls itself public access theater–free theater–takes on this difficult Eugene O’Neill play and reimagines it on a set resembling a metal playpen and starring six African-American actors, who play all parts and genders. The result is startling and thought-provoking. My review says “O’Neill wrote the play about Irish seamen doomed to a life in the stokehole of a transatlantic liner, unrecognized as humans by the wealthy people who traveled on the decks above. Cole has cast his Oracle production with African-American actors, which provides additional layers of meaning and rekindles the class and economic commentary in O’Neill’s 94-year-old script.” Tickets are free–it’s a tiny space–and reservations are recommended. Thru March 12.